Heat oven to 350°F. In ungreased 8-inch round pan, mix brown sugar and whipping cream. Sprinkle with pecans. In small bowl, mix granulated sugar and cinnamon. Unroll breadstick dough, but do not separate into breadsticks. Sprinkle cinnamon-sugar mixture over dough. Roll up dough from short end; separate at perforations. Place coiled dough in pan. Bake 20 to 25 minutes or until golden brown. Cool 1 minute. Place heatproof serving plate upside down onto pan; turn plate and pan over. Let pan remain 1 minute so caramel can drizzle over rolls. 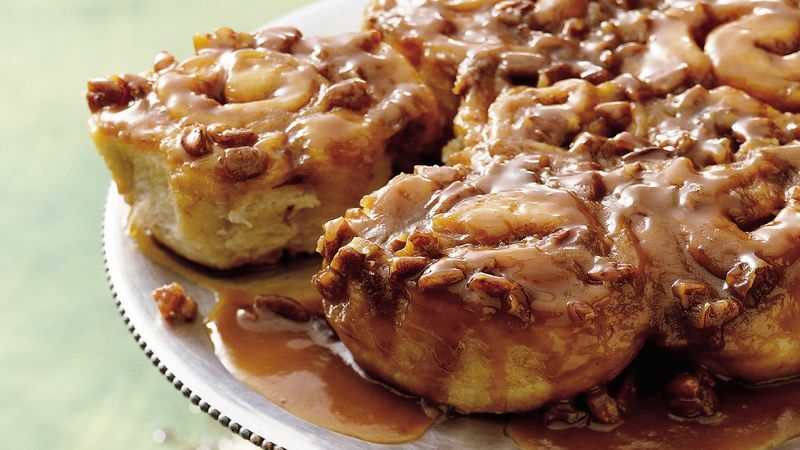 Easy Caramel Apple Sticky Rolls Omit the cinnamon-sugar mixture and spread 1/3 cup cinnamon-flavored applesauce over dough. Serve these gooey rolls with a platter of fresh fruit, Canadian-style bacon slices and a pot of fresh-brewed coffee for a fast and fabulous holiday breakfast.